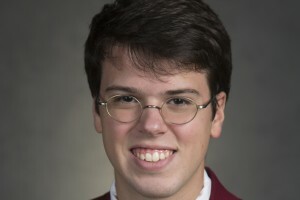 SHREVEPORT, LA — Ben Green, a senior at Centenary College and a Shreveport native, has been chosen as a finalist for the prestigious Rhodes Scholarship. Green will travel to Birmingham, Alabama for an interview on November 19, the final stage in a rigorous application process that also required him to submit a personal statement, an institutional endorsement, and eight letters of recommendation. The Rhodes Scholarships are the oldest fellowship awards in the world and provide full funding for international students to pursue degrees at the University of Oxford in Great Britain. Each year, an application process representing all 50 U.S. states, the District of Columbia, and U.S. territories selects 32 young scholars for this coveted award. Centenary has had just one previous Rhodes Scholar, Hoyt Duggan, who graduated in 1960. At Centenary, Green has had the opportunity to work as an intern at the Meadows Museum of Art and to curate the critically-acclaimed #exhibit. If he is selected as a Rhodes Scholar, Green plans to pursue two graduate degrees at Oxford: a Master of Studies in Art History and Visual Culture and a Master of Science in Visual, Material, and Museum Anthropology. He worked throughout the summer to refine his 1,000 word personal statement outlining how a Rhodes Scholarship and study at Oxford will help him achieve his academic and career goals. Green’s success in the Rhodes Scholarship competition comes as no surprise to his academic advisors. Green has also impressed College administrators throughout his career at Centenary, serving as a student representative on several key administrative policy committees and leading the Student Government Association as president in his senior year. In 2015, over 800 Rhodes Scholarship candidates were nominated by their colleges and universities. The decentralized application process divides the United States into 16 districts, with each district selecting a small number of finalists to advance to the interview round. On the afternoon of November 19, following a morning of individual interviews, each district will designate two “scholar-elects” to join the 2017 class of American Rhodes Scholars.